Walter William Wensinger, Lieutenant General, United States Marine Corps (retired) fought in four World War campaigns and was decorated in all of them, served at Marine Corps Headquarters, Washington, D.C., as Special Advisory Assistantt to the Marine Commandant, prior to retiring on August 1, 1956. Beginning his career as a Private during World War I, he was commissioned 18 months later. In the 1920s and 1930s, he served at sea with Marine Detachments aboard the battleships Nevada and New Mexico and on expeditionary duty in Nicaragua and China. In World War II, he earned the Legion of Merit with Combat "V" as Assistant Chief of Staff, G-3 (Operations and Training), of the 4th Marine Division at Roi Namur in the Marshall Islands. He received a Gold Star in lieu of a second Legion of Merit in the same capacity at Saipan and Tinian and the Navy Cross (next highest U. S. Navy decoration to the Medal of Honor) as Commander of the 23rd Marinesat Iwo Jima. The latter citation states in part: "Occupying an exposed position under heavy fire from land artillery and coastal defense guns (the then) Colonel Wensinger personally directed the landing attack of his regimental combat team over a beach strongly defended by a fiercely resisting enemy. Observing that his leading elements were suffering heavy casualties and that the tanks and other mechanized equipment were unable to assist in the advance, he ordered the movement of his command post to the immediate vicinity of the front lines. Landing amidst intense fire from mortars, artillery and automatic weapons, he aggressively maneuvered the units under his command in effecting rapid seizure of the assigned objectives. Colonel Wensinger's superb leadership, gallant fighting spirit and tactical skill were in keeping with the highest traditions of United States Naval Service." General Wensinger was born on September 4, 1894, at Defiance, Ohio, and he graduated from high school at Fremont, Ohio, and obtained his Bachelor of Laws degree from the Univ of Michigan in Jun 1917. He enlisted in the Marine Corps a month later, and after serving with 8th and 13th Marine Regiments, he was assigned to the Second Officers Training Camp at Quantico, Virginia. There he was commissioned a Second Lieutenant in December 1918. In April 1919, after completing the Marine Officers School for Service Afloat, he began his first tour of sea duty with the Marine Detachment aboard the USS Nevada. He completed that tour in November 1921, and saw service at Mare Island and San Diego, California, between then and March 1924, when he was ordered to the Marine Barracks at Pearl Harbor, Territory of Hawaii. He returned from there two years later to serve on the staff of Candidates Class at Marine Barracks, Washington, D.C. In March 1927, he was ordered to China for expeditionary duty with the 6th Marine Regiment, which later became part of the 3rd Marine Brigade. He then served as Brigade Intelligence Officer until his return to the U.S. in January 1929. In December 1930, after commanding the Marine Barracks at Pacific Coast Torpedo Station, Keyport, Washington, he began another tour of expeditionary service with the 2nd Brigade in Nicaragua. He was awarded Special Letter of Commendation by the Secretary of the Navy for his service as Brigade Adjutant after an earthquake and fire devastated the city of Managua on March 31, 1931, killing approximately 1,000 people. Returning to the U.S. later in 1932, he was stationed at the Marine Corps Base, San Diego, where served for a time as aide to the Commanding General. From there, he was ordered to Quantico in May 1932 to serve as a student, and later, an instructor, in the Company Officers School. He began two more years of sea duty in June 1935 as Commander of Marines aboard the USS New Mexico. In July 1937, he was assigned to the Office of Judge Advocate General of the Navy where he remained for the next three years. He returned to the Marine Schools at Quantico in August 1940, and after completing the Senior Course, served once more on the School's Staff. He was detached in November 1942 to attend the General Staff Course at the Command and General Staff School, Fort Leavenworth, Kansas, and on completing the course, he returned to Quantico in February 1943 as Assistant Director of the Staff and Command Course at the Marine Schools. With the activation of the 4th Marine Division, he was ordered to San Diego in July 1943. and embarked for the Pacific Theater in January 1944, as the Division's Assistant Chief of Staff, G-3, serving in that capacity until he took command of the 23rd Marines in October 1944. After Iwo Jima, he was assigned to 5th Amphibious Corps in April 1945 as that organization's Assistant Chief of Staff, G-3, with additional duties as Chief of Staff, Advanced Command Post. At war's end he represented the 5th Amphibious Corps and the 6th Army in dealing with Japanese authorities in Southern Japan. Returning to the U.S. in March 1946, he served briefly in the Office of the Inspector General of the Navy. He then took command of the Marine Barracks at Puget Sound Naval Shipyard, Bremerton, Washington, where he performed additional duties as Distrist Marine Corps Officer of 13th Naval District. From there was ordered to Marine Corps Headquarters, Washington, D.C., where be became Legal Aide and Legislative Counsel to Commandant of the Marine Corps in February 1948. He was promoted to the rank of Major General in October 1951 and became Director of Plans and Policies at Headquarters that December. After that served as Deputy Chief of Staff and as a member of Naval Dept Task Force in the Office of the Assistant Secretary of Defense for Manpower and Personnel. He was named Special Advisory Assistant to Commandant of the Marine Corps in July 1954, and served in that capacity until the time of his retirement, when was promoted to his present rank. In addition to the Navy Cross, the Legion of Merit with Combat "V" and Gold Star in lieu of a second and Special Letter of Commendation from the Secretary or the Navy, he holds the Presidential Unit Citation Ribbon with two Bronze Stars; the Good Conduct Medal; World War I Victory Medal; Yangtze Service Medal; Expeditionary Medal (China); Second Nicaraguan Campaign Medal; American Defense Svce Medal; American Campaign Medal; Asiatic-Pacific Campaign Medal with 4 Bronze Stars; World War II Victory Medal; U.S. Navy Occupation Service Medal with Asia Clasp; National Defense Service Medal and Nicaraguan Medal of Merit and Diploma (Nicaraguan Award). He is married to former Katherine Elizabeth Miller of Kalispell, Montana. Parents were the late Charles F. and Louisa Wensinger of Fremont, Ohio. Died July 10, 1972 at Virginia Hospital, Washington, D.C. 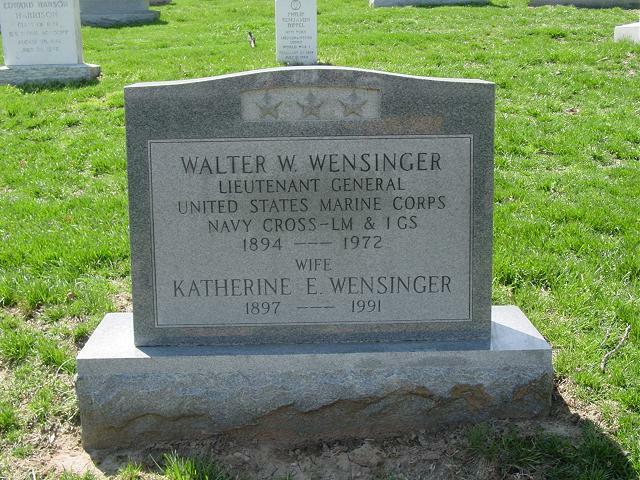 He is survived by wife, Katherine Miller Wensinger of 4000 Massachusetts Avenue, N.W., Washington, D. C.
He was buried in Section 5 of Arlington Natonal Cemetery. For extraordinary heroism as Commanding Officer of the Twenty-Third Marines, Fourth Marine Division, in action against enemy Japanese forces on Iwo Jima, Volcano Islands, from 19 February to 16 March 1945. Occupying an exposed position under heavy fire from land artillery and coastal defense guns, Colonel Wensinger personally directed the landing attack of his Regimental Combat Team over a beach strongly defended by a fiercely resisting enemy. Observing that his landing elements were suffering heavy casualties that the tanks and other mechanized equipment were unable to assist in the advance, he ordered the movement of his Command Post to the immediate vicinity of the front lines. Landing amidst intense fire from mortars, artillery and automatic weapons to discover that the beach and evacuation facilities were completely disrupted and inoperative, Colonel Wensinger quickly provided improvised means for the removal of the wounded and for the essential supply of his units ashore and, upon arriving at the advanced locations of his Command Post aggressively maneuvered the units under his command in effecting the rapid seizure of the assigned objectives. Courageously continuing the attack the following day, he remained in the forward area throughout the day and contributed materially to the successful completion of this vital operation. Colonel Wensinger's superb leadership, gallant fighting spirit and tactical skill were in keeping with the highest traditions of the United States Naval Service. WASHINGTON, July 13, 1972 – Lieutenant General Walter W. Wensinger, USMC, retired, who served with distinction in the Pacific in World War II, died Monday in the Veterans Administration Hospital. He was 77 years old and lived here. General Wensinger’s service in the Pacific brought him the Legion of Merit for his action as Assistant Chief of Staff of the Fourth Marine Division at Roi Namur in the Marshall Islands; with a Gold Star for like service at Saipan and Tinian; and the Navy Cross as Commander of the 23rd Marines at Iwo Jima. Born in Defiance, Ohio, he graduated from the University of Michigan in 1917, when he entered the Marine Corps. He was assigned to Quantico and was commissioned in 1918. After World War II, General Wensinger represented the Fifth Amphibious Corps and the Sixth Army in dealing with Japanese in Southern Japan. He retired in 1956.